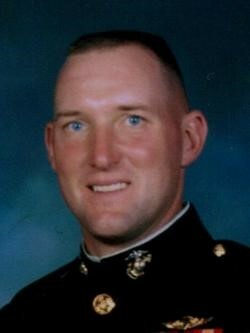 Marine Corps Captain Todd M. Siebert, 34, of Baden, Pennsylvania was assigned to 3rd Battalion, 6th Marine Regiment, 2nd Marine Division, II Marine Expeditionary Force, Camp Lejeune, North Carolina. On February 16, 2007, while conducting patrol in the Al-Anbar province, Iraq, Captain Siebert’s armored military vehicle was struck by an unidentified projectile. He had only been in Iraq for six weeks and died as a result of injuries sustained from the explosion. A 1990 graduate of North Allegheny High School, Todd Siebert was a member of the JROTC program. He enlisted in the Marines in 1992 and was promoted to Sergeant two years later. He received a commission as an infantry officer in 1999 after he graduated from Penn State University. Captain Siebert was a member of the Marine Historical Society and an avid collector of World War II military memorabilia. He also enjoyed landscaping. In 1994, he got married and the couple had two children. Captain Siebert’s decorations include: Purple Heart, Navy and Marine Corps Commendation Medal, Navy and Marine Corps Achievement Medal, Combat Action Ribbon and many others. Both of his children were Folds of Honor scholarship recipients.